Bizarro and the Trickster converse atop an historic castle in Syria. Their conversation is ended by the Trickster's need to eat, and Bizarro flies them both to a Big Belly Burger, in Israel. While there, Bizarro errs and hits another customer. 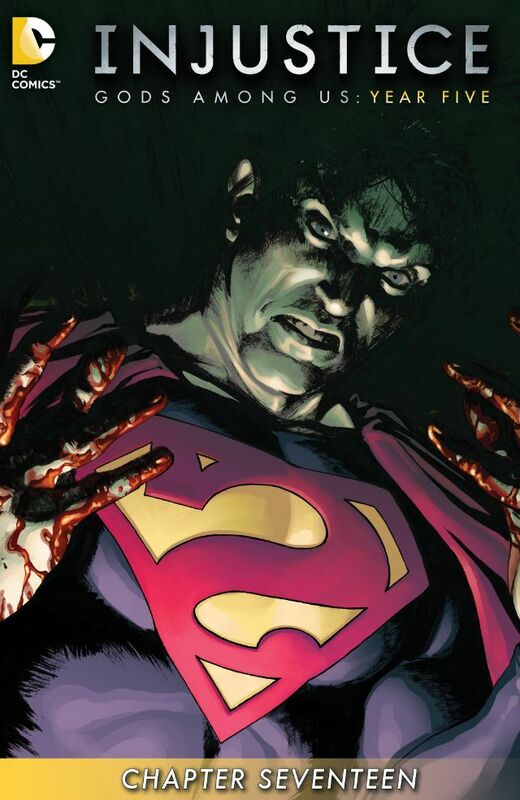 The customer overreacts, a fight ensues, and Bizarro kills everyone... with the exception of the Trickster. Story - 2: Standard Injustice story. Death and destruction resulting from everyone and their dog being more dysfunctional than Dr. Jekyll. I suppose it doesn't matter that trained mercenaries, soldiers, etc., would be unlikely to react over such a trifle as an errant, empty hamburger container hitting them, or Bizarro having it in his dim mind that killing everyone is the best way to be rid of witnesses, but Injustice must maintain its kill count or lose relevance... or something. The worst thing about the issue is that there is no concrete movement of the story, and this the last year. There are only seven issues remaining (Thank God) and aside the Gotta Catch Them All plot coupon that started the year off, there is no centre, no core to this year, for an already shallow storyline. We knew that Bizarro was going to wreck shop, but couldn't that at least have been structurally sound? Would it have been too much if the mess could have been entertaining, somehow? The answer is just all too obvious.